Picture of Today 2/27/2017, Late Winter Jams.. The winter is still maddening for the Pacific Northwest, especially here in Seattle. There was some rain, snow, and lightning. There was no order to any of it, just a jumble of madness. Some areas were moreso on the weathering than others. Meanwhile, the main roads contained a lasting standstill of heavy vehicle traffic jams throughout the day. The air felt chilled, unwarning of the sudden hail. The evening slush was plentiful throughout the Downtown area, with leftover snow scattered about. Now the near future weather is up in the air, with no promises of any tranquility. Carry a good umbrella and warm coat. 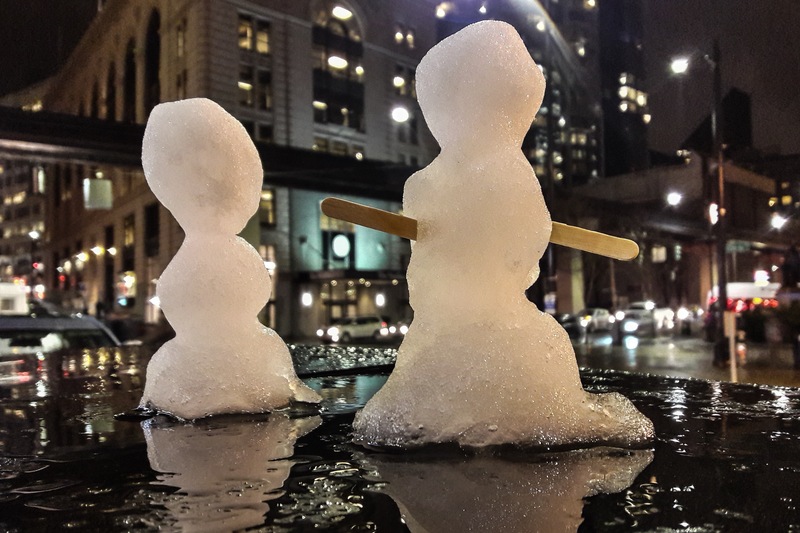 Posted on February 27, 2017 by Orion T.	This entry was posted in Citynature, nightlife, Seattle and tagged chill, Photography, Seattle, snow, snowmen, winter. Bookmark the permalink. ← Picture of Today 2/19/17, Life Puzzle..